On entering this lovely home it is apparent that the property has been refurbished to a very high standard using quality finishes and manufacturers to create a executive home style feel. The present owners have spared no expense on upgrading the specification, accommodation and landscaping the gardens. The spacious hallway leads to most of the ground floor rooms with the impressive living room found at the back of the house with doors and windows opening onto the lovely garden. 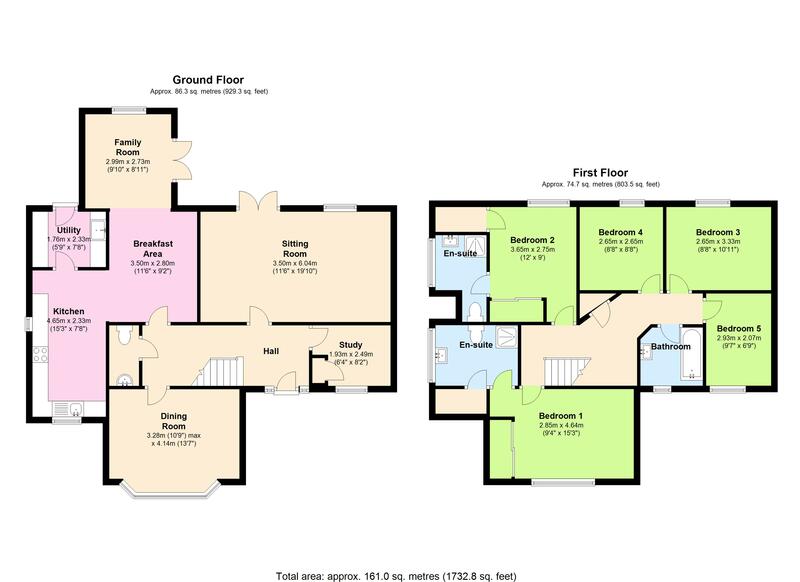 There is a useful study/playroom and a separate bay fronted dining room to the front of the house, that could also be used as an additional family room as the kitchen/breakfast room/family room is a great entertaining space and is the hub of the home. The kitchen has been greatly upgraded and enjoys an excellent range of built in appliances, a good range of cupboards and drawers complimented by granite worktops and upstands. There are windows to two aspects ensuring good light in the kitchen. From the kitchen the breakfast room leads into a comfy family room with doors opening onto the garden. In addition there is a useful Utility room again fitted with granite worktops with appliance space beneath and fitted cupboards and a door to the side. The attractive first floor landing provides access to the bedrooms and to the luxurious and contemporary family bathroom. Of the five bedrooms, four are doubles with the master bedroom and the guest bedroom both benefiting from bespoke fitted wardrobes and luxurious contemporary en suite shower rooms. The garden is a particular feature having been cleverly landscaped being laid mainly to lawn with raised well stocked beds planted to provide colour and interest throughout the year. There is a resin bonded patio and pathways to the rear of the house and a large pergola, beneath which, is a seating area.